It's been a while since I've written a new 10 Barn Weddings, so I had a lot of fun going through tons and tons of gorgeous weddings for this post! While deciding what the theme should be this time around, I realized I've never done a post on blue weddings! And I'm not even sure why, because we've put together a whoooole bunch of them. So many, in fact, that I had a hard time narrowing them down! Blue as a wedding color is seriously underrated, y'all. Whether it's pale blue, navy, or any shade in between, you're bound to find another pop of color that will pair with it perfectly. And it is perfect paired with just a simple neutral, too. 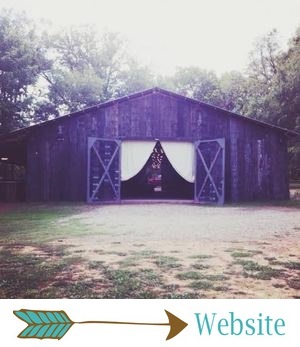 It works for themes from rustic to glam, and The Barn looks so pretty in blue! Here are just a few of my favorite BLUE BEAUTIES! A blue, yellow and red color palette. A bold, super fun dessert table. Mismatched bridesmaids' dresses in bold, bright colors. The prettiest bridal gown EVER. Summery, sweet, bright bouquets and florals. Rustic chic details with serious garden vibes. An amazing altar... Those were just a few of the highlights of Alyssa + Matt's colorful summer wedding. This wedding in one word: FUN! Tara + Casey's color palette included slate blue, a pale watercolor blue, ivory and gold. It was understated, classic, romantic and lovely. It was proof that blue is beautiful enough on its own, without the addition of a bright pop of color! Their bouquets were very classic, with blue hydrangeas and white peonies. They had simply elegant blue, ivory and gold reception tables. And they had one of the prettiest cakes ever: a marbled blue cake with gold trim and a custom gold calligraphy cake topper! Brandi + Rey paired navy and powder blue with burgundy, and my goodness, was it beautiful! One of the most unique, unexpected color palettes we've had in a while, for sure. Their florals were DELICIOUS... They were rich in color, and they absolutely made their wedding. Aside from the flowers, my favorite details from this wedding were: Brandi's simple, laidback dress. Their lovely naked cake. And the bridesmaids' mismatched dresses. This one was simple and super SWEET! We're still swooning over Emily + Blake's Anthropologie-Ralph Lauren-book inspired wedding, with its blue, gold, champagne and chocolate color palette and amazing details! Seriously, the details were AMAZINGGGG. Chambray for days, deer antlers, vintage books, whiskey barrels, a stunning book backdrop, the naked cake to end all naked cakes, unbelievable bouquets, and so much more. This one was unforgettable! Cara + Brock's wedding was classic and timeless, but it was full of style and fun details. Their color palette was blue, green and white, and Cara practically planned the entire design of the wedding around some pretty blue paisley tablecloths! These two were married inside The Barn, and it was nothing short of magical. Love, love, looooved their bouquets (full of hydrangeas!) and their BLUE (like really, really blue) reception tables. This was one of the most fun groups ever! Navy and gold go together like weddings and pineapples... Say what?! Samantha + Matt chose navy and glittery gold for their color palette, and their wedding theme was PINEAPPLE-CHIC! No, really... There were pineapples everywhere, but this wedding managed to be glamorous, chic and absolutely stunning. Their bouquets were full of orange flowers and succulents, and I know the whole thing sounds like there was a lot going on, but it couldn't have come together more beautifully! You've gotta see this wedding and all the dreamy photography! Jaime + Jake came all the way to The Barn from Hawaii! Their slate blue, ivory and burlap wedding was just stunning. It was rustic-meets-glam, with all kinds of special details. Just a few highlights: Jaime's swoon-worthy beige gown, traditional white florals with pops of blue, a fun lemonade bar, a glam head table backdrop, burlap AND sequins, homemade bacon jam favors, and bold, blue reception tables. Ally + Tyler's sweet summer wedding had a color palette of pale blue, blush, ivory and gray. The Barn looked SOOO amazing in pale blue, y'all! Their wedding was full of sweet, personal touches, from photos of the couple lining the aisle to a beautiful worship session during their ceremony. My personal fave details: the bouquets, the pale blue linens, the aisle decor, and their beautiful cake. This wedding was simple and understated, but SO pretty! Lyndsey + Brad wanted a fun, romantic theme for their wedding, and that's exactly what they got! Their colors were navy, coral and gold, and their details were so fun! Chevron galore (even on the guys' bow ties! ), coral flowers, adorable bow napkins on their tables, family heirlooms throughout their decor... There was a lot to love about this one! Fun fact: these two booked with The Barn before ever even seeing the place! Brittany + Tyler also chose navy, coral and gold as their wedding colors! Their theme was rustic-chic, and their wedding was oh, so sweet. Details we loved: coral flowers (the ranunculus bouts were precious! ), Brittany's dresses (she wore two! ), the bridesmaids' navy lace dresses, s'mores favors, and glittery gold throughout their decor.